This Phoenix Tungsten Ring is great for someone looking for the classic tungsten look with a little extra flare. The reason this photo has a dark background is so you can see the gold colored line going thru the ring. This ring is identical to the classic 8mm band, except for the gold colored line going around this fantastic ring. This style is very clean with sleek lines to make this ring stand out. Excellent choice for the masculine simple man. Imagine wearing a ring that never needs polishing, a ring that is virtually scratch proof. 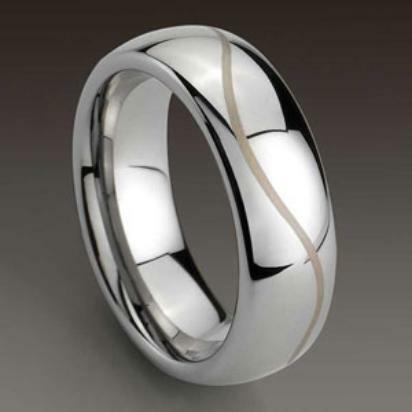 Tungsten rings are the future and your looking a one of the best styles out there! Features: High scratch-resistant tungsten, four times harder than titanium. This tungsten ring is comfort fit contoured on the inner surface for a more comfortable fit. Completely hypoallergenic, our tungsten carbide rings will never turn your finger green or cause irritation to your skin. If you need a durable yet elegant ring, this is for you! Included 100% Money Back Guarantee! Also comes with a black velvet stylish ring box and FREE SHIPPING! Was this answer helpful? 10 of 11 Customer(s) found this Answer helpful. Q: This photo has a dark backgound, why? A: With the normal photo, it was difficult to see the brushed line in this ring. With a darker background, it stands out to show the unique style of this ring. Bought this to replace my gold wedding band of 30yrs. Flew off my cold, skinny finger while snow clearing. This is a high quality ring with a subtle wave pattern. I am impressed by the "comfort fit". The printed ring gauge from Tungstenfashion web site worked perfectly for size. Was considering the all gold version but was not sure how the plating would hold up. Perhaps a trial? I can't believe how wonderful this ring is! I have worn it to work and play and there has been no damage to it what so ever. Amazing quality and a great price. Excellent customer service. I ordered the ring using another ring sizer and was off a little. Emailed and called the very next day to correct ring size before shipment and sure enough it was done. My husband is very happy with the feel and size. The only thing is that he wished the "lines" was more noticeable. Otherwise, we are very pleased. This ring is very elegant and at an affordable price...but...the gold ring design wasn't etched as distinctly as I expected. I will be wearing often, nevertheless. I was looking for a ring for Valentine's Day for my husband when I spotted this one. After reading the positive reviews I decided this was the ring. I've purchased several rings from Tungsten Fashions in the past and have been very pleased. They are weighty and durable, with a gorgeous shine! I expected the ring to be more of a white gold color as the picture depicts, but it is actually more smokey. 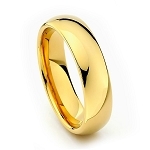 The gold line that undulates around the ring is not as pronounced as in the picture, but still a unique touch. My husband absolutely loves it! Very nice. Love the simple look with a touch of unique style. Blold Sleek Look that we love! Love the sleek look of this ring. We also purchased the 8mm Classic Tungsten Ring and love that as well! Bought this for my husband and our 30th wedding anniversary. The quality of this ring is outstanding! It arrived very promptly and fits perfectly! Love it! It is a replacement for our original wedding band. After 20 yrs. the band was wearing badly. So pleased to have found tungstenfashions! Got my ring and it is gorgeous and fits perfect. It is everything as nice as I thought it would be. Thanks again. I am very happy with the two rings I ordered; they stay shiny, are beautiful to look at and some people think it represents white gold. The price is also very decent. Definitely recommended! This is the second one of these I have purchased. My son laid claim to the first. It is a beautiful and quality piece. I particularly like the heft of it and the 'Comfort Fit.' Looks good and feels good. Expect to pay a lot more if a similar item is purchased thru a jewelry store. Excellent product and very pleased with purchase. Fast processing and excellent customer care. Thank you! Great ring ! All as I expected it to be ! Delivery was fast and size was perfect fit ---price/quality unbeatable--I will wear this always! Nice ring. Better than expected. Really nice quality for price! We decided to buy these rings for our wedding because they look beautiful and their shine will last longer. I received the rings in a week and a half, and they look as advertised in the website. We are very happy with these rings and I will recommend this website to my friends. Thank you Tungstenfashions!! Love this ring. Right size. Color is gorgeous. Very pleased with this purchase. Fine materials used. Fits perfectly. Engraving is excellent. Cost cannot be beat for the quality of workmanship.